With spring around the corner, all thoughts are turning to fruit, while we wait for stone fruits to arrive. Nectarines, peaches, plums and apricots will soon be at the markets, usually led by cherries, which are often the first to make an appearance. I was leafing through Sweeter Off the Vine, by Yossy Arefi, a book dedicated to using fruit year-round, from squash, pumpkin and apples in the fall, to blackberries and figs, which – depending on where you live – signify that summer is coming to a close. I saw a galley (a preview) of the book before it was published and thought, “Wow – this is gorgeous!” (And wrote an enthusiastic quote for the book jacket.) Plus it was full of the kinds of desserts I like a lot, fruit-forward, bursting with berries, cherries, citrus, and more. I got so excited when I got an actual copy of the book that I couldn’t wait for cherry season, and used some frozen ones to bake up a sneak preview. I’d originally bookmarked a whole wheat cobbler with blueberries and had a stash of blueberries in my freezer from last summer. Blueberries are very hard to come by in Paris, so I decided to save those. (Still not sure for what…) But cherries, once the season starts, become widely available. And decided to bake up the Cherry Poppy Seed Cake. I once wrote a book on fruit desserts, although publishers were wary, saying that people weren’t that interested in fruit, which was a surprise to me, because I love fruit. But they look at the numbers. However I think that’s changed over the years as we’ve gotten used to celebrating fruit, with all the green markets and farmers’ markets, and all the varieties and specimens to choose from. I know from experience that I always buy way too much. When I see people buying two apricots or four figs at the market, I think, “Is that all? ?” By the time I get home, my shoulder is sore from lugging the hefty kilos of fresh fruit home. 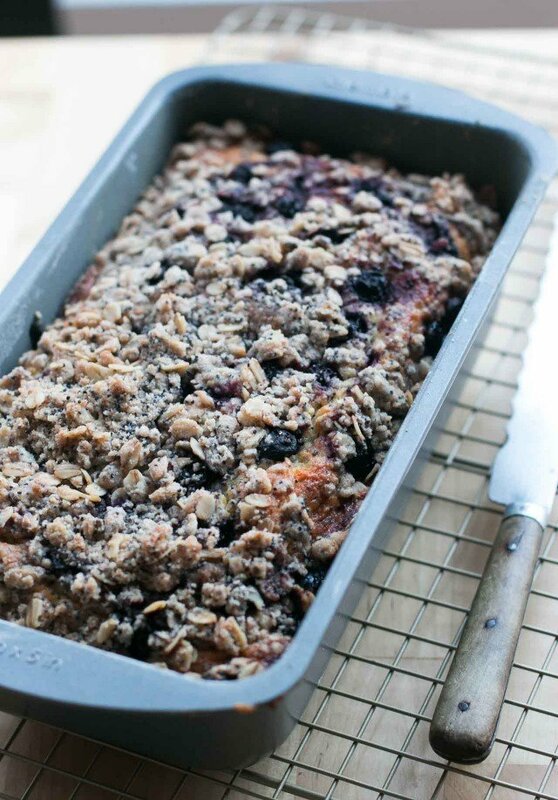 People often ask me about reducing sugar in dessert recipes and if you’re one of those people, this loaf cake is for you because it’s not overly sweet. It’s also quite dense, and moist, with a less-distinct crumb than a traditional pound cake, as it uses oil and yogurt, rather than butter. If you like things on the tangy side, like I do, you might want to swap out raspberries, blueberries or use sour cherries, if you have them. Diced fresh apricots or plums would be lovely as well. With its pebbly, crumbly topping, lemon-lovers could rev up this snack cake with a lemon glaze, like the one I used on this Blueberry Buckle with Lemon Syrup. Or take it in another direction with the thicker orange glaze that I used on this Polenta Cake. I’m also tempted to add a handful (about 3/4 cup/120g) of white chocolate chips or chopped white chocolate to the batter. But since I made the cake twice this week – yup, I ended up using my precious blueberries for a second loaf (below) – I’ve got cake up the wazoo to finish. And I’m not complaining. Adapted from Sweeter Off the Vine by Yossy ArefiIf using frozen cherries* or berries, fold them in while they’re still frozen. 1. Preheat the oven to 350ºF (180ºC). Butter a 9-inch (23cm) loaf pan, dust with flour, and tap out any excess. 2. 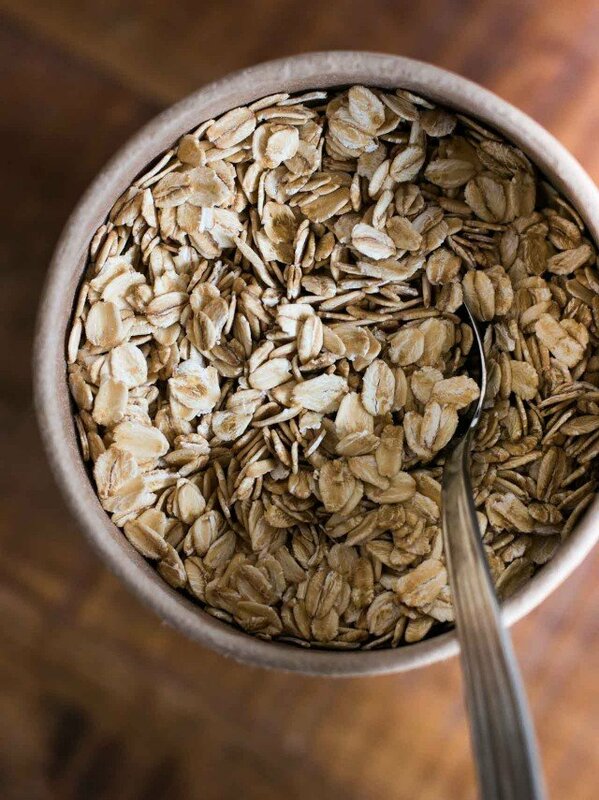 Make the streusel by mixing the 1/4 cup flour, oats, brown sugar, poppy seeds, cinnamon or cardamom and salt in a small bowl. Add the butter and use your fingers to break the butter into small pieces, until the streusel is in small bits. Set aside. 3. To make the cake, whisk the flour, baking powder, poppy seeds and salt together in a small bowl. 4. In a large bowl, rub the sugar and lemon zest together very well with your fingers, encouraging the lemon oil to saturate the sugar. Whisk in the oil, eggs, yogurt and lemon juice. Add the flour mixture all at once, stirring with a rubber spatula until it’s almost completely incorporated. 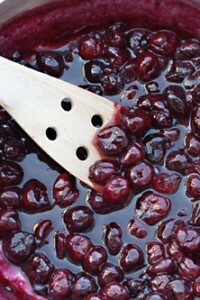 Fold in half of the cherries and scrape the batter into the prepared pan. 6. Let the cake cool on a wire rack. When cool, run a knife along the outside of the cake to help it release from the pan and tip the cake out of the pan. Storage: The cake will keep for up to three days at room temperature, if well wrapped. You can freeze it for up to two months. *Frozen cherries are available at Whole Foods in the U.S., at Picard stores (as griottes, or sour cherries) in France. I will definitely be trying this. Yum! Still have some cranberries in the freezer, leftover from Thanksgiving. Sounds like they might work in place of cherries as well! I’m TOTALLY making this for mother’s day! If using frozen cherries do I need to defrost them first, or can I toss them in straight from the freezer? Use them right from the freezer. Great. 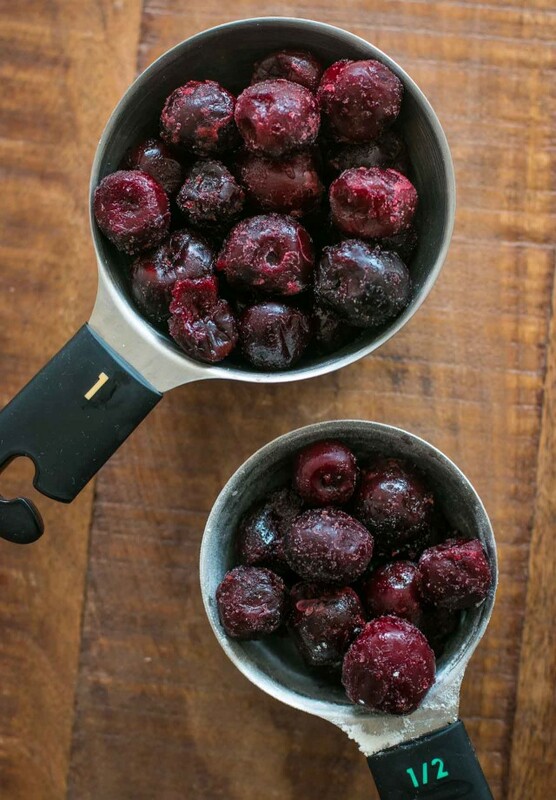 I have some frozen mirabelles and cherries from last season to use. This reminds me of a poppyseed cake my grandma used to make. I find frozen blueberries at Casino in France. I don’t even buy figs at the market because they are inevitably smashed by the time I get home. But there is a field nearby completely encircled by fig trees and blackberries, with the ripe fruit just rotting on the ground. So I have no qualms about picking a little container from time to time. 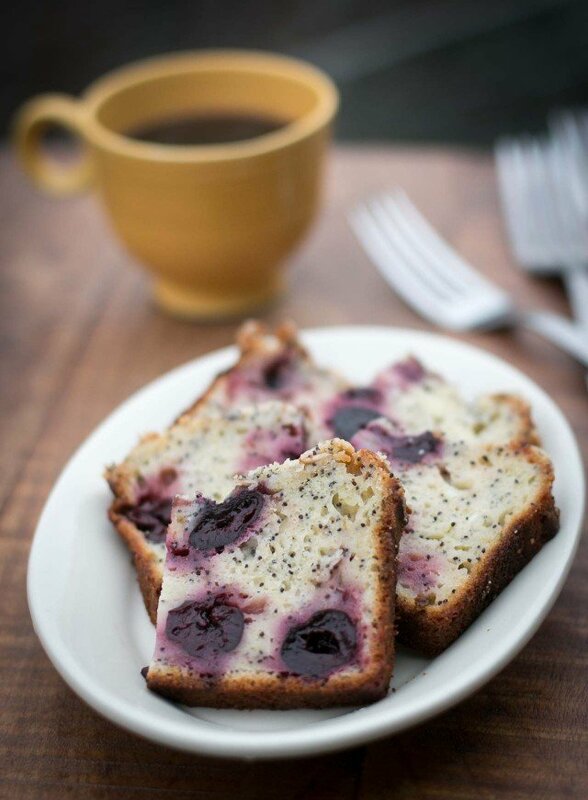 I have special memories of a cherry poppy seed bread at Christmas time from a dear, departed friend. Thanks for the reminder! I realize “Poppy Seed” is in the title of this recipe, but do they add so much that they should absolutely be in the recipe. In other words, can I leave them out with changing the flavor too much? Thank you. This recipe sounds wonderful, but for the benefit of your English readers, could you please give an amount in grams for the “2 tablespoons” of butter. I have no idea how to measure butter by the tablespoon. Er, out of curiousity, how *do* people measure butter by the tablespoon? Do they squish/pack it in, or just scoop, or…..? Butter in the US is often sold in sticks that are wrapped in parchment paper. The paper is printed with measurements (like a ruler) so you can just cut off what you need. Yes, I’m aware of that (sorry if I sound smarmy)…..there are certain French butter wrapppers that carry the measures too…. Most European recipes (at least in France…) express things smaller than 1/4 cup/60ml in terms of spoonfuls – the French say “soup spoons” and “coffee spoons.” True, they’re less exact than American teaspoons and tablespoons, but in general, most French recipes give the cook a little more “give” and are less-precise with certain measurements, I think because they assume the cook/baker will make some assumptions. Cherry season is coming…this cake looks lovely! Reminds me of a poppy seed layer cake I’ve had. Cherry season is coming…what a good idea! I have no fresh, or frozen, herries so would this work with cherries in a jar?? Could I use sour cream instead of the yogurt? Thank you for this lovely recipe and cookbook selection. Since I developed an allergy to chocolate (yeah, I know), I’m always on the lookout for new fruit desserts. This looks beautiful, and I appreciate the suggestions on how to vary it. Your blog is a pleasure to read. Jane: Maybe, but I haven’t tried it. If doing so, I’d drain them very well first. If you do try it, let us know how it turns out. kevin: Sorry, yes, it’s grams – fixed! I just made this with blueberries. Definitely one of the best!! I will be baking this again! This looks divine!! At first, I thought the poppy seeds were vanilla bean powder-which I have been obsessed with lately! 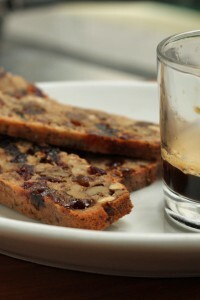 I think I would add some in this (already) delicious-looking recipe! I have a very old poppy seed cake recipe which has one bringing the cup of poppy seeds to a boil with one cup of milk and then cooling before proceeding with the recipe. Doing this step brings up a very sweet taste in the poppy seeds which doesn’t show itself unless one does this. 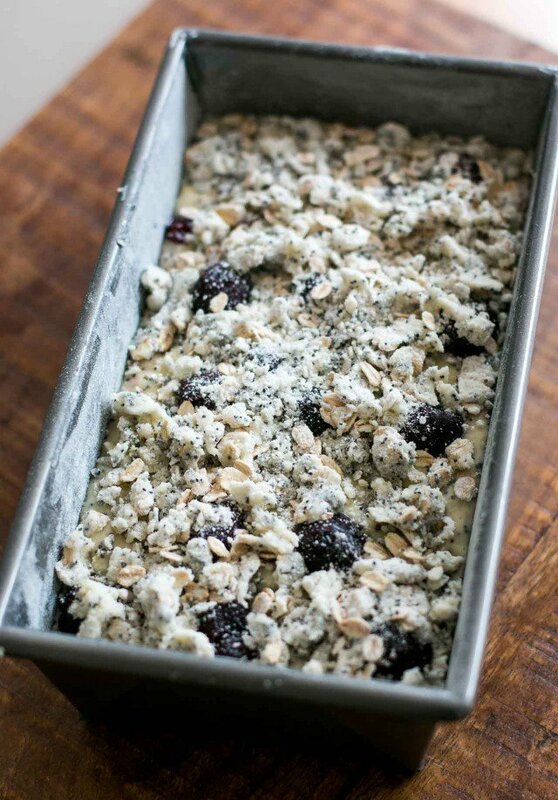 I am wondering if I could heat the yogurt with the poppy seeds, cool, and proceed with the recipe here. Does heating the yogurt change the qualities it gives to this recipe? Looks amazing! 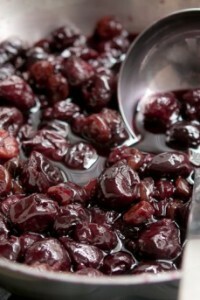 We have very moist dried griotte cherries here in Turkey. David, do you think dried can work?? Cannot wait to make..thank you! Also find a publisher for your fruit book…remember Julia Childs got a no from a publisher who no doubt is still crying! Could you explain why if you use frozen cherries, you don’t need to adjust the cooking time or temperature? We experimented very successfully with preserving lemons (Meyer lemons, actually). Now I am wondering what would happen if I took a quarter of a preserved lemon, removed the innards (pulp, membanes), rinsed and chopped the peels very fine and added that? Where I live, we only get dried berries, never fresh or frozen. Would it be ok to use dried blueberries? Or should I soak it overnight to soften them before using it in the recipe? Judy + Naz: I’ve not made it with dried fruits but if you want to give it a go with them, yes, I would soak or plump them first to rehydrate them. A rather splendid looking way to put another dent in the sour cherries in my freezer. They’re from Dad’s tree and this looks like something he would love. Can’t wait to give it a go. FYI – Costco/US has frozen cherries most of the time, too. Love your recipes and blog..thank you. I too made this the same night (with my delicious Costco frozen cherries that I’d forgotten about!) It sank in the middle and took about 60 minutes to bake- it was cooked around the edges but still raw in the middle every time I checked. I was worried that it would be dry on the outside and wet inside, but nope, it’s lovely. I will definitely make again. Mine sank, as well. The streusel is partially on top and partially now under some cake. Oh well, I’m sure it will be delicious. Still waiting for it to cool. With my anticipation building all day… just to see the recipe (because the darn web page wasn’t loading for me all afternoon! )… I’d built up a lot of momentum while waiting, so once I could see it I knew this dessert was getting made for sure this very evening! It was really wonderful… dense, moist, lemony, delicious. A nice treat! Luckily, I had a huge bag of frozen pitted cherries from last year’s season, a bunch of lemons, and a tub of yogurt lying around (unfortunately it was nonfat, but at least it was Straus so it was good quality). If anyone was curious about the baking time, which some found to take longer than expected, I too found that it took longer than planned to bake till done in the center. I checked it at 40 minutes and it needed much more time. I gave it another 5 and still it was a bit jiggly in the center, so I turned the oven down to 325 and let it go for another 10. Checked again and skewer was ‘almost’ clean, so I turned oven off and let cake sit in still-hot oven for about 5 more. Finally I got a clean skewer check, and I let the cake cool or a bit. (Not too long! I was too anxious to get into it!). The cake was moist — it definitely was fine letting it stay in the oven for the extra time. When you all make this, just keep checking… and testing… and you will be well rewarded! It’s great! Would this work with some kirsch soaked cherries thrown in with the ordinary cherries? Or would they overpower the mix? I love cooking with fruit, it’s great at keeping baked goods moist and tasty. this looks and sounds amazing! Your photograph makes me want to crawl through the screen! Fruit desserts are superior to all other desserts (except maybe chocolate). I usually eat cherries by the pound once they’re ripe next to a fan with a glass of sparkling water by my side. Since that sort of extravagance is quite a few months out, I’ll have to scout for some frozen cherries and heat up the oven. I can’t wait to check this book out. Why can’t we print from this page any more? I wanted to copy the recipe because it looks great and I would like to make it. But I can’t print the recipe. Is there something that lets you print this page?? Thanks so much! I recently found out that for those that work in a business where drug testing is carried out – poppy seeds may cause a positive result for opium and morphine. For that reason I have been leaving the seeds out as I would never want a guest to have a problem. Since lemon glazed poppyseed muffins are an office staple in most US cities it can’t pose much of a problem! At least, not one they aren’t already very familiar with, haha. I use chia seeds as that’s what I have. I too am DOT random drug tested. This was in a Seinfeld episode. Elaine and her poppy seed muffins! This was very good. Came out nice but took over 2 hours to bake through due to the frozen cherries. The streusel top was a bit overdone as a result but it was eaten up quickly! I made the cake twice, using frozen fruit both times and my baking time was around 50 minutes. You may want to get an oven thermometer and check the temperature of your oven. I used frozen cherries, and the bake time was 60 minutes. Yum…I have the frozen cherries handpicked here in the Finger Lakes, just waiting for your delicious cake. 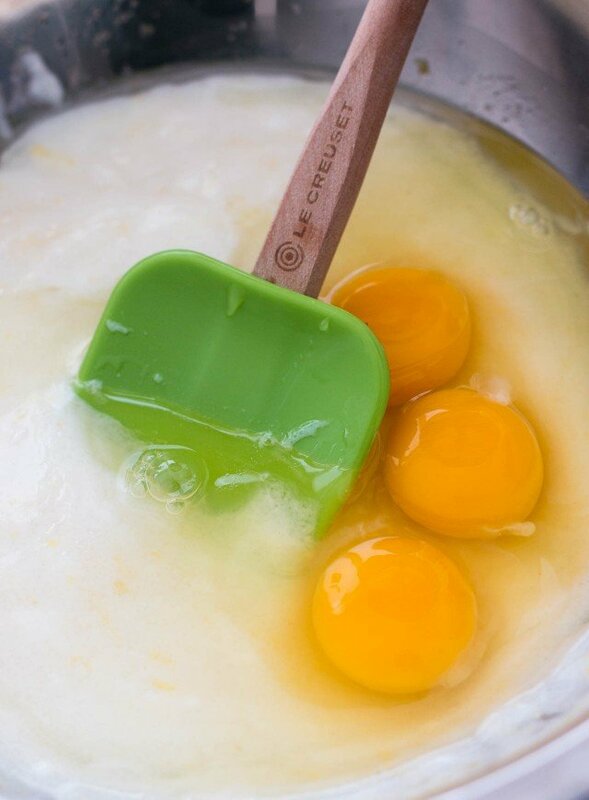 Love that Le Creuset spoon spatula–bought one of those after your post on Le Creuset and it’s my favorite. Thanks, David. I just made this with canned tart cherries (in water) and my gluten free mix. I drained the cherries fairly well, just so they weren’t dripping liquid, but didn’t stress over it. Needed 65 minutes of baking but it came out looking really beautiful and delicious. What was your gluten free mix made of, Angie? To this recipe I added a little less than 1 tsp xanthum gum to the cake part, no gum to the topping. I might play around with an extra egg if your eggs are small, and it definitely needs extra time in the oven. I’d also consider using some almond meal if you can do nuts, but that GF mix has been pretty satisfying. Thank you! I’m going to give it a try asap. I have a gluten-free pie crust that I made waiting for its strawberries and rhubard. That one comes first! I made this with your gluten free mix. I thought that the cake was a little dense. Perhaps I over mixed it. What is your mix like without yougurt, subbed for flour in a different cake recipe? I also needed much more time to fully bake the cake. I also thought it needed vanilla and more sugar, but that could just be me. This is day 3, and it’s still fine. Yes, as mentioned in the post – “It’s also quite dense, and moist, with a less-distinct crumb than a traditional pound cake.” I also said that it’s on the less-sweet side, although a # of readers write to ask me about less-sweet desserts, so I mentioned it because it might meet their needs. The frozen cherries I used were nice but I also tried it with (frozen) blueberries, which were quite flavorful. This looks amazing. Has anyone tried a dairy free version of this? ), earth balance for butter. I clicked the baking soda link with great interest, hoping to learn something. I was taken to the “Ingredients for American Baking in Paris.” I looked all the way through for the information but there is nothing about baking powder at all. Baking soda? Yes. Yeast? Yes. No baking powder. I made this over the weekend and it turned out perfectly!! Thanks!!! Hi David – could you substitute butter for the oil? If so, would there be any difference aside from the buttery taste? Thank you! I’ve not tried substituting butter in this recipe, but since butter is only about 80% fat, you may need to toggle the other ingredients to compensate for that. I’m not sure how to do that without testing it myself, so you’d probably have to do a little experimenting. Thank you very much for the reply. I will let you know what the result was when I try using butter. I bought some frozen cherries from TJ’s but they had no flavor. Fresh is best but until cherry season arrives, I would probably use cherries in a jar and freeze them before using. My frozen cherries were flavorless as well. I made this yesterday, it’s amazing! Not too sweet. Mine took 70 min to cook, worth the wait! I made this with the last of our cherries from last summer. So easy and so tasty. It did take longer to bake – about 70 minutes. We sliced it immediately (although I know we shouldn’t have) to have some to take for our tea on a sunny warm day (it had snowed the day before) – biked to the lake and enjoyed the cake tremendously. Thank you for sharing the recipe. Excellent soft crumb to this cake, with great lemon flavor. I’m not sure the cherries add anything, and would go with a more flavorful fruit next time. Mine were frozen from Whole Foods. BTW, I had to bake an extra 30 minutes, probably because I added a few more cherries than called for and that created more liquid. The cake did not suffer at all from the extra time in the oven. Just made this cake a few days ago. We have cherry trees in the yard, so we always have frozen cherries available year-round, both sweet and sour. The cake was in the oven for about 70+ minutes, perhaps due to my making adjustments for our convection oven. The cake is wonderful. We served it with a dollop of our own yoghurt.